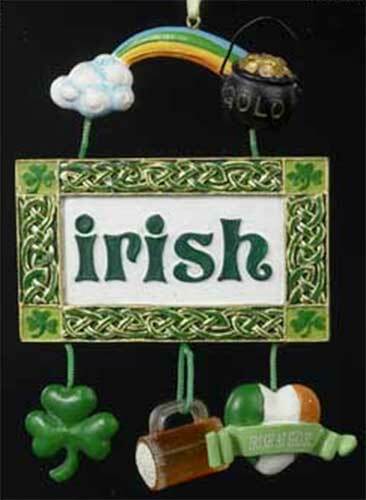 Irish ornament features a banner with a rainbow and pot of gold charm above, along with shamrock, mug and heart charms dangling below. This Irish Christmas ornament features a textured banner with embossed Celtic knot-work; it is further enhanced with dimensional Irish charms. The banner is suspended by a pot of gold at the end of the rainbow charm; while shamrock, beer mug and tricolor Irish heart charms dangle below. The Irish charm ornament is made of resin and measures 3" wide x 4" tall x 3 and it is ready to hang on your Christmas tree with the included ribbon. This Irish ornament is gift boxed with shamrock and Celtic knot history cards, complements of The Irish Gift House.